The pain. 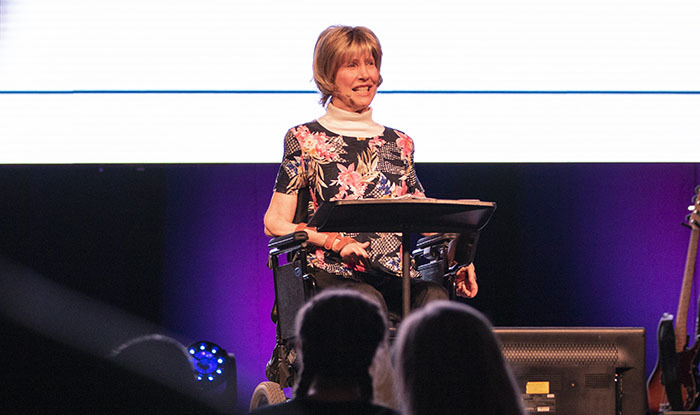 Joni Eareckson Tada kept talking about the pain, the overwhelming pain, both physical and mental. It is a wonder she even gets out of bed every morning — always needing assistance just to do that. But her caregivers are doing more than just lifting her up physically. It is as if they are Christ’s arms and strength. In a talk bookended by standing ovations from the crowd of more than 6,000, Tada recounted how she became paralyzed in July 1967 when she dove into shallow water. She told of how she couldn’t imagine going from an active, busy childhood to a life without use of her arms and legs. She said she wanted to die. She talked about the Bible verses she heard then: from James 1 (welcome this trial as a friend), Romans 5 (rejoice in suffering), Philippians 1 (it has been given to you to suffer on His behalf) and Romans 8:28 (it somehow would fit into a pattern for good). “Man of sorrows!” What a name. It was exactly what Tada needed. “That night, something changed. Something she did touched me like nothing else,” Tada said. “And it’s odd because that night I did not get answers. But suddenly the questions weren’t that urgent. “You see, God’s got His reasons for allowing so much pain and heartache and suffering, and those reasons are good and right and true. But I will be the first to tell you that when your heart is being rung out like a sponge, an orderly list of the 16 good biblical reasons as to why this is happening, it can sting like salt in the wound. You don’t stop the bleeding with the answers. Tada’s ministry seeks more people to do what Jackie did, and she was quick to note that “God’s not looking for experts. He’s just looking for people to meet a need.” God is in the middle of our suffering, but we need people — God’s change agents — to help with it, too. She has seen how easy it is – too easy – for people to just keep the disabled at arm’s length, even when offering a kind word or generous donation. Anyone who wants to help can go to wheelsfortheworld.org or bit.ly/donate-az. There are millions of people who need a reason to get out of bed in the morning, even if it means another day of pain and suffering. ● For a replay of Chapel, including the music performed by the Worship Team, click here. ● Next week’s speaker will be Mia Koehne of Mia Koehne Music. 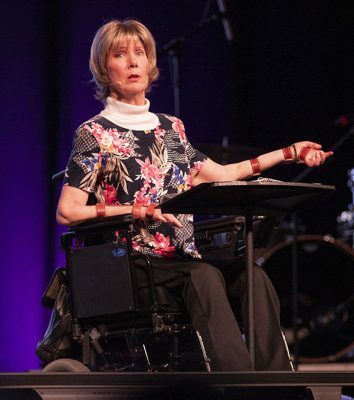 I’m an online student that is disabled and in a wheelchair and the message from Joni Eareckson Tada encouraged me to continue and finish my Masters. God is so great and he only knows my daily physical pain and my emotional struggles. At the present time I needed to hear that is not bad to let others know your limitations and when is time to take a break to prevent burnout. I did not want to mention my limitations and struggles so my instructors will not think that I was using my disability as an excuse. Thanks for that message. I admire your courage to do the things that you do. You are an inspiration to a lot of people, including me. I do not think I would be able to do any of the things that you have done. I know it must be hard at times to face the day and I cannot image what you are going through. I have had to deal with the pain of losing loved ones, but never the loss of use of my arms or legs. I am currently taking online class at Grand Canyon University to get my bachelor’s degree in Accounting. Keep up the good work. We all struggle in life and we will all experience pain, but we have to understand that God is just testing us for when our pain finally ends we will be with him in all of his glory, and this post does a good job expressing that.